A fun combination of a racing and educational title. Cars for the Leapster takes place after the story in the movie concludes. Racecar Lightning McQueen has moved his race headquarters to Radiator Springs, but he and his fellow cars need help getting the city noticed. Players are asked to enter car races to earn tokens so that they can buy neon for the town's signs. The software offers four racetracks with two levels of difficulty. Kids choose a racetrack and which racecar character (Lightning McQueen, Mater, Flo, or Ramone) they want to be. Each racetrack has its own obstacles and educational challenges. Kids drive by using the Leapster's multidirectional arrow pad which controls both direction and speed. Pressing the up arrow increases speed, while pressing the down arrow slows the car, and shifting to the right or left lanes happens by using the right and left arrows. Depending on the track, kids use the A and B buttons to jump over or avoid obstacles. The educational content appears within the race in the form of decisions about driving. For example, in the Carburetor Cup race, one of the four racetracks offered in the software, kids will drive up behind three racecars traveling in a row across all three lanes. The software shows a sequence of geometric shapes on the top of the screen, and asks kids a question about the position of these shapes ("Which shape is on the right?"). To answer, kids must speed up and bump the car showing the correct shape before they can zoom forward. The Parent Guide for the software suggests that the two levels of difficulty correspond to concepts for preschoolers and kindergarteners. However, the skills required to race these cars are too hard for most preschoolers. 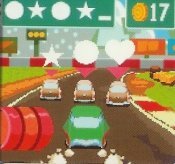 Players must be able to use the multidirectional arrow pad to speed up, slow down, and change lanes while pushing the A and B buttons to perform other tasks that require timing including jumping over oil slicks, inflating tires to drive over puddles, or blowing the horn to tip over tractors. Choose this fun educational racing game for kids who are in kindergarten through second grade.